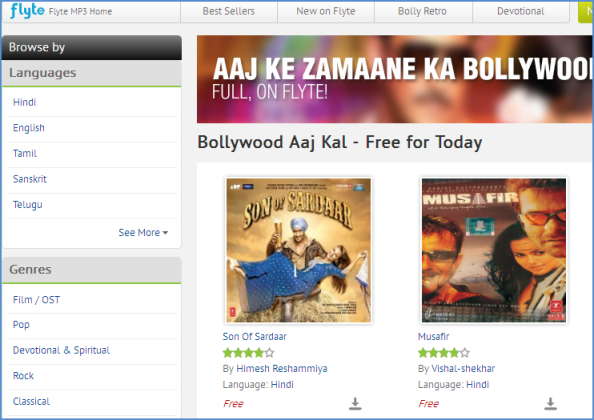 Flyte is an online music store from popular online store FlipKart. In Flyte site, you can download single songs or music albums in mp3 format across the various languages. FlipKart started this service last year, so Flyte celebrating its first birthday on coming Feb 28, 2013. They are giving an offer to download 100 free music albums every day up to Feb 28. How to Download Free Music Albums? Go to Flyte.com and select your favorite genre. There are many genres listed such as Bollywood, Ghazals & Sufi, Devotional, Rock and even Regional languages like Tamil and Kannada. Then search quickly for your favorite music albums and click on “green” download button. Your selected music album will be added to your library and you can download at anytime. Flyte has the mobile apps for Android, iOS and Windows Users. You can download directly from their site or from mobile apps. The music albums listed for today will be changed for next day. So check the website everyday and download your favorite albums.